[Rajesh] put web scraping to good use in order to gather the information important to him. He’s published two posts about it. One scrapes Amazon daily to see if the books he wants to read have reached a certain price threshold. The other scrapes Rotten Tomatoes in order to display the audience score next to the critics score for the top renting movies. Web scraping uses scripts to gather information programmatically from HTML rather than using an API to access data. We recently featured a conceptual tutorial on the topic, and even came across a hack that scraped all of our own posts. [Rajesh’s] technique is pretty much the same. He’s using Python scripts with the Beautiful Soup module to parse the DOM tree for the information he’s after. In the case of the Amazon script he sets a target price for a specific book he’s after and will get an email automatically when it gets there. With Rotten Tomatoes he sometimes likes to see the audience score when considering a movie, but you can’t get it on the list at the website; you have to click through to each movie. His script keeps a database so that it doesn’t continually scrape the same information. 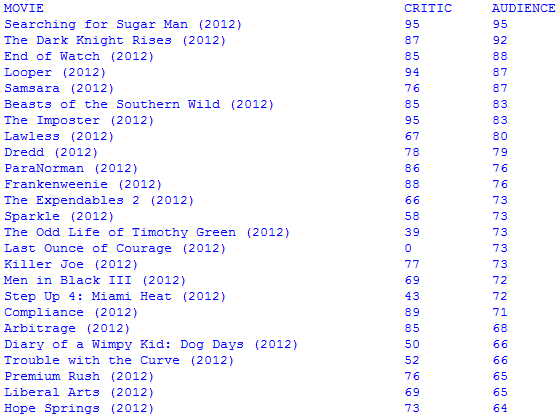 The collected numbers are displayed alongside the critics scores as seen above. Whenever [Gareth James] needs to catch a train he has only to push a button on this frame and the next three departure times will be displayed. As you can see from the post-processing in the photo, this is accomplished by a Raspberry Pi board using a few familiar tools. Let’s take a look at the hardware first. He acquired a 7″ LCD display which he removed from its plastic case. The bare screen will easily fit inside of the rather deep wood frame and its composite video input makes it quite simple to interface with the RPi board. There was a little work to be done for power. The LCD needs 12V so he’s using a 12V wall wart to feed the frame, and including a USB car charger to power the RPi. The last thing he added is a button connected to the GPIO header to tell the system to fetch a new set of times. A Python script monitors the button and uses Beautiful Soup to scrape the train info off of a website. To get the look he wanted [Gareth] wrote a GUI using tkinter. Don’t miss the demo after the jump. If you need a bit of a primer on scraping web data take a look at this guide.